The FBI has released photos and video of two suspects they want to identify as part of the investigation into Monday’s Boston Marathon bombings. CCTV captured the two men, one wearing a dark-colored baseball cap and the other a white cap, near the scene. Shown to the media at a press conference at the Sheraton hotel in Boston, the blurry images show the as-yet unidentified men at the scene of both bomb blasts along the finishing line of the race on Boylston Street moments before the detonations. 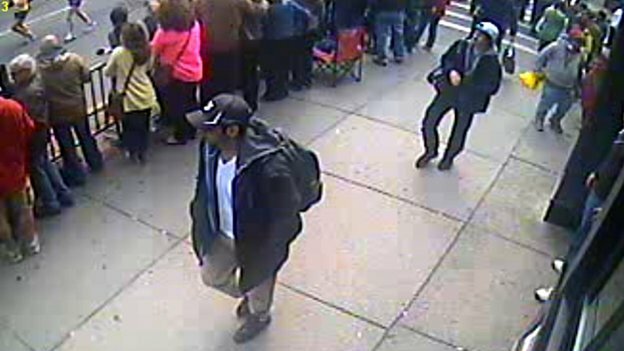 Designated by FBI Special Agent Richard DesLaurier as “suspect one” and “suspect two” – suspect one is dressed in dark clothes wearing sunglasses, while suspect two is clearly wearing a white baseball cap on backwards – both are seen in the images with back-packs on. Making a direct appeal to the public agent Richard DesLaurier asked for any information, however insignificant that could lead to them identifying and eventually speaking to this individual. The FBI agent also warned members of the public not to approach them if they think they see them. “We consider them to be armed and extremely dangerous, No one should approach them, do not apprehend the,” said Richard DesLaurier. Richard DesLauriers said footage showed the suspect in the white hat putting his backpack down at the site of the second explosion just in front of the Forum restaurant. “We strongly encourage those who were at the Forum restaurant but haven’t contacted us yet to do so,” he said. Richard DesLauriers said the FBI was aware of no additional threat. At least one of the Boston bombs was made from a pressure cooker packed with explosives, nails and ball bearings, investigators have told US media. The devices were placed in black bags and left on the ground. At this point, investigators have been sifting through masses of images, gathered by either civilian fan footage and multiple surveillance cameras in the area.